Finance and Mass Media Minister Mangala Samaraweera and Customs Director General P. S. M. Charles at the Finance Ministry auditorium. 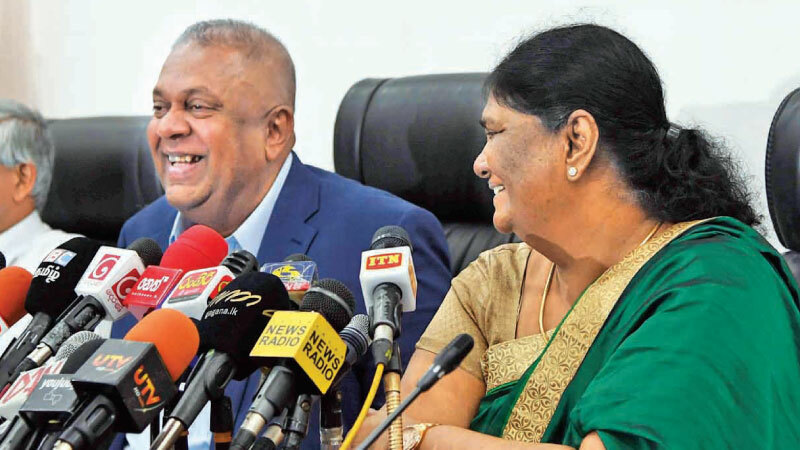 Finance and Mass Media Minister Mangala Samaraweera said that a committee would be appointed chaired by a retired judge to probe into the leakages in the Customs that prevents a massive custom revenue collection. He added that although the Customs Tax collection in 2018 had increased to Rs. 921 billion in the face of the previous year’s tax collection of Rs. 831 billion it could not reach the 2018 target of Rs.1,068 billion. He made these observations yesterday during a press conference held at the Finance Ministry auditorium. He pointed out that the Sri Lankan rupee devalued by 15 percent during the last six months of last year and in turn, Custom’s revenue collection should increase since tax is collected in US dollars. However, Customs had not been able garner this benefit at collection points. Minister Samaraweera said imports in 2018 had increased by 8.3 percent whereas the custom tax collection had not increased comparatively. He added that the custom tax revenue had only increased by 1.4 percent. He said further that the when the narcotics arrest is concerned, the Customs has been able to seize only 5 percent of them and the rest has been done by the Police, STF and other institutions. He added that when the pepper and arecanut re-export involves a massive corruption which was initiated during Mahinda Rajapaksa regime.He added that the same is continued with the involvement of the Sri Lanka Customs officials.The government is taking measures to prevent it. Customs Director General P. S. M.Charles also spoke. Finance Ministry Secretary Dr. R. H. S. Samarathunga, Treasury Senior Deputy Secretary A. R. Deshapriya also were present at the occasion.